The Bele Chere Music & Arts Festival in Asheville This Weekend! Originating from an ancient Scottish dialect, Bele Chere (pronounced Bell Cher) translates as beautiful living. Beautiful living is what you'll find on any given day here in Asheville but especially so during the festival, which celebrates the arts and the beauty they bring to everyday life. Slated as the largest free street festival in the Southeast, festival goers enjoy complete immersion in the arts accompanied by great local fare and some of the best brews around. This year's festival begins on Friday, July 27 from noon to 10p.m., continues on Saturday, July 28 from 10a.m. to 10p.m., and concludes on Sunday, July 29 running from noon to 6p.m. Beginning in 1979, the Bele Chere Festival was born as a collaboration among the merchants of downtown Asheville as they envisioned a necessary revitalization of their downtown business district. Thirty-four years later, the festival continues to draw large crowds centered around the local restaurants, art galleries, retail stores, theatres, and art exhibitions. Asheville's vibrance and creativity shine during this festival which showcases both local and national artistry. The Arts Park exhibits jewelry, photography, pottery, woodwork, paintings, and metalwork all of which are handmade. Artists that are not featured in the Arts Park exhibit their works throughout the festival grounds. Many local merchants are on-hand offering unique and hard-to-find items. Performing arts are highlighted by interactive performances and street entertainers. The Lexington Avenue Performance Area features interactive performances throughout the weekend. Street performers can be found throughout the festival in various locations. The 2012 Bele Chere featured artist is stone sculptor Collene Karcher, who resides in Bakersville, NC. The festival offers a variety of music to fill the heart's desire. There is a very full venue of performances scheduled over the three days and throughout its four stages. Peruse the line up and schedule for musical performance details including performer background information, times, and locations. In addition to all we've already mentioned, there are a variety of other activities happening during the festival. One of the most popular events is the Purina Ultimate Air Dogs show. Cheer on these athletic dogs as they fly through the air, land in a pool, and compete for the longest leap. 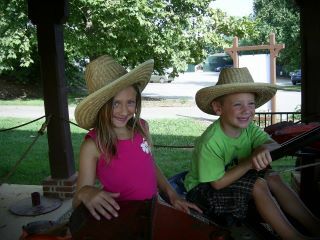 The Children's Area focuses on family fun for the little ones and offers crafts, rides, performances, and so much more. Check out the Children's Area Performance Schedule for a full listing of activities and times. Asheville's mobile art lab, the Easel Rider, is also offering free interactive activities for all ages. Other activities include the Bele Chere 5K, karaoke, non-profit booths, and a senior oasis. There is truly something for everyone here. As a quickly rising premiere culinary destination, Asheville promotes farm-to-table fare and is actively involved in local food movements. Foodtopia takes place at the Taste of Asheville in Pack Square featuring local restaurants showcasing a sampling of Asheville's finest cuisine. Street food vendors can also be found around the perimeter of Pritchard Food Park. Beverage booths serving water, soda, beer and more are located throughout the festival. Find out for yourself why Asheville has been voted Beer City USA for four years in a row. The region houses more than 10 breweries most of which can be found represented at the festival. Not into beer? Wine is also available for purchase. Before we wrap things up, here are just a few final thoughts on things you should know when attending the Bele Chere Festival. Downtown parking is very limited during the festival. Park and Ride shuttle service is available, and the shuttles run approximately every 20 minutes for a cost of $2 roundtrip. Pets are prohibited within the festival boundaries. Leave them at home or you can leave them at the Doggy Jail (it's not as bad as it sounds...). It's a cool, clean, friendly place located in front of City Hall to leave your pet while you attend the festival. Sunday is alcohol-free day during Bele Chere. (No, the alcohol is not free.) Alcoholic beverages cannot be sold on this day nor are they allowed to be carried on the streets. It might be helpful to review the Festival Guide for further information. Or you can visit belecherefestival.com for complete festival information. Well, we hope you are as excited about the Bele Chere Festival as we are. Don't forget that there are some perfect downtown Asheville vacation rentals which can make your stay during the festival comfortable, and most of all, convenient. 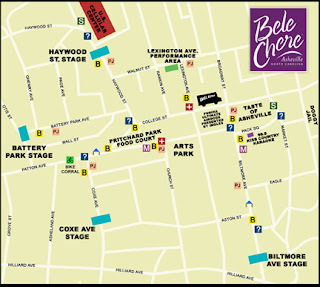 Have you been to the Bele Chere Music and Arts Festival? If so, be sure to tell us about your experiences in our comment section. Cheers to celebrating and appreciating beautiful living! Outdoor adventure abounds here in Western North Carolina. Last week's blog focused on some fantastic motorcycle riding routes throughout this part of the state. This week, we'd like to focus on a different kind of riding—bicycling. Whether you prefer a relaxed, leisurely ride through our scenic towns or you're seeking a more challenging mountain biking route, we offer opportunities for both extremes and everything in between. The North Carolina Department of Transportation offers cyclists a bicycle transportation map that is a great tool when deciding where to ride based on ability and traffic handling skills. 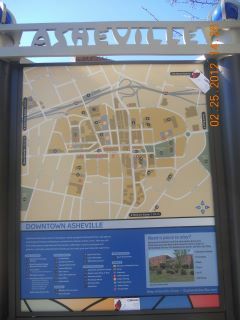 Click on the Urban Area Maps link and the Asheville and Buncombe County Bicycle Transportation Map will be the first on the list. This map highlights more demanding climbs through the mountainous areas of the county as well as showing parks, points of interest, and other popular destinations. Cyclists will also find Asheville's 10 locally signed neighborhood bike routes highlighted on the map in addition to bicycle safety information and tips. Map enlargements for Asheville, Weaverville, and Black Mountain are also included on the map. The rules and regulations for bicycling the Blue Ridge Parkway are listed as well. Courtesy of the Blue Ridge Bicycle Club, cyclists can view and print pocket-sized cue sheets for over 70 different bike riding routes in Buncombe County. There is an overview of each route that gives helpful information which includes information such as the city location, start points, total ride miles, total ascent, and a ride effort index. Just click on the route that fits your interest and ability level, and the cue sheet will load offering the detailed directions of the ride route. Many of the local bike shops and outfitters offer loosely organized group rides in addition to bicycle sales and rentals, as well as other cycling supplies. To explore more of what they have to offer and for more information on the local riding trails, check out this list of area bicycle shops and outfitters. If you happen to be in town this weekend, be sure the catch the French Broad Cycling Classic (FBCC) happening in various towns throughout Western North Carolina from July 20 - July 22. The FBCC is a 3-day bicycle stage race (Omnium) that promotes amateur racing throughout the USA drawing over 600 racers from an eight-state radius (NC, SC, VA, TN, KY, GA, AL, FL). It usually occurs on the third weekend of July and offers some of the most competitive bicycle racing in the United States. This event is free to the public with the best viewing occurring during the Sunday Criterium, which runs from 8a.m. to 6:30p.m. For a full list of event times and details, visit the French Broad Cycling Classic website for more information. 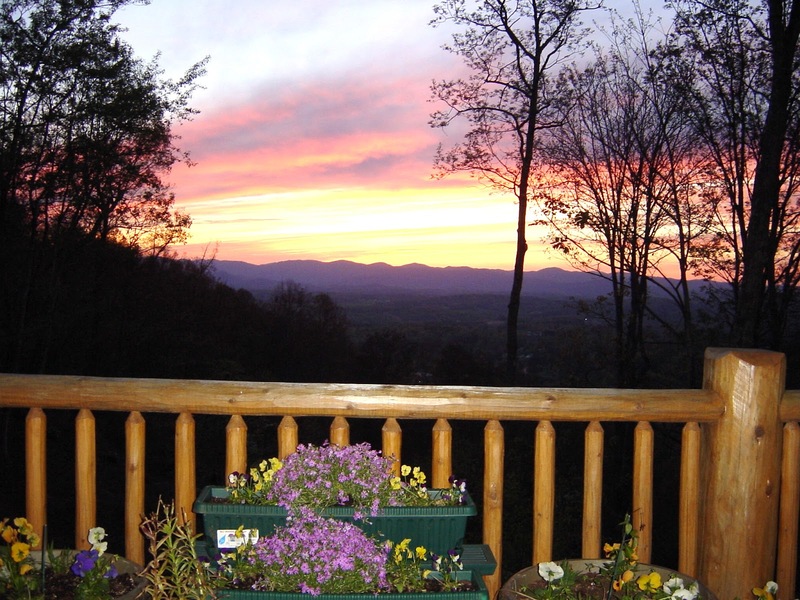 Don't forget that we offer a nice selection of vacation rentals to make your stay in Western North Carolina the best it can be. 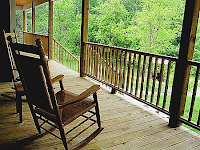 Whether you prefer to have your accommodations close to downtown Asheville or if you are more interested in a secluded mountain retreat, you'll find a nice selection of choices with the amenities you desire. We look forward to seeing you in and around Asheville. If you've had some biking adventures during your visit here, be sure to share them with us in our comment section. Happy cycling! Western North Carolina is a motorcyclist's dream. More often than not, Western North Carolina will be found in the rankings of Top 10 Places to Ride a Motorcycle in the USA in blogs, articles, and polls of favorite places to ride. This area of our state is a motorcycle mecca known for a nice range of easy to challenging curves, incredible mountainous and pastoral scenery, as well as an abundance of motorcycle ride routes and loops from which to choose. You can find a list of favorite North Carolina ride routes here with links to detailed ride maps to help you plan your motorcycle adventure. A popular ride route is the 469-mile-long Blue Ridge Parkway which meanders through the Blue Ridge Mountains and offers stunning views of the Appalachian landscape without the distraction of stoplights, billboards, and commercial vehicles. 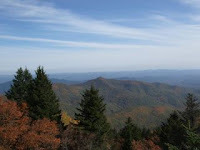 Riders can access the Parkway in several places from the city of Asheville. The Cold Mountain Loop (yes, the Cold Mountain of movie fame) and the Lake James Loop are two Blue Ridge favorites. If you're considering a motorcycle trip along the Blue Ridge Parkway, you might find this how-to guide helpful as it provides additional helpful hints for motorcyclists. One of the premier destination rides in the east that rivals the Blue Ridge Parkway is The Dragon at Deal's Gap which boasts 318 curves in 11 miles. The Dragon and Cherohala Skyway are often combined to give riders a challenging and scenic loop ride. The route known as the Tail of the Dragon has a fascinating history. It begins on the North Carolina side on US 129 at Fugitive Bridge with a view of the Cheoah Dam. (This is where Harrison Ford jumped in the movie The Fugitive, just FYI.) It ends 14 miles across the mountain at the Tabcat Creek Bridge in Tennessee. Riders may want to add The Crossroads of Time to their itinerary; it's a popular hangout for cyclists on this route. With all of these places to ride, now you just need a place to stay! 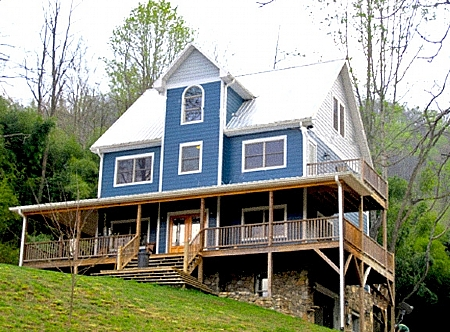 Asheville Connections has a variety of vacation rentals in ideal locations for bikers. 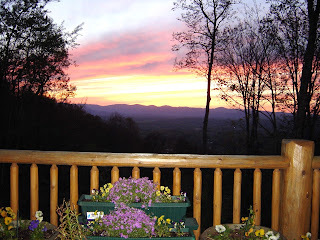 Properties such as Harvest Moon Estate are tucked away from the crowds yet only 35 minutes from downtown Asheville. Just hop on your Harley-Davidson and you'll only be minutes from fabulous rides up Doggett Mountain to the quaint towns of Trust and Luck. Here you'll also be conveniently located to Hwy 63 and routes leading to the Tail of the Dragon and continuing on to Tennessee. 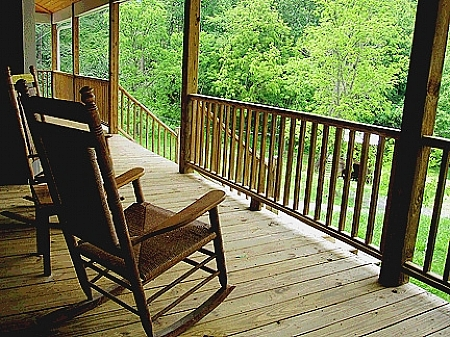 After a long day's ride, relax on a rocking chair on the front porch and take in the views, enjoy billiards in the game room, or soak in the jacuzzi tub. Check out Harvest Moon Estate's map location for destination details. Motorcycling is one of the many reasons to visit Western North Carolina. Have you ever been on a motorcycle ride through this area? Tell us where you went, what you did, and what you saw. If not, we hope to see you on the open road soon! Free Shakespeare in the Park in Asheville: It's a Mid-Summer's Night Dream! Whither wander you on a midsummer's night? How about wandering on over to Hazel Robinson Amphitheatre located on 100 Gay Street in Asheville and experience free Shakespeare in the Park courtesy of the Montford Park Players. 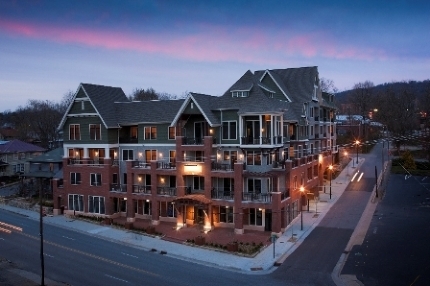 It's a great way to spend a Friday, Saturday, or Sunday night during your stay in Asheville. Here's a little history about the Montford Park Players. 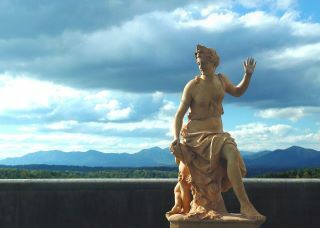 Their underlying purpose is to bring Shakespeare and other classic plays to the mountains of Western North Carolina. 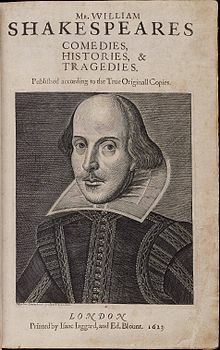 They see Shakespeare as an important part of their common heritage and set out to make his plays available for everyone to experience, free of charge. For the past thirty-nine years they have been providing quality productions of classic plays in an authentic outdoor setting. They see this as fulfilling a vital role in the performing arts community. A Midsummer's Night Dream is currently running through July 21 on Friday, Saturday, and Sunday evenings beginning at 7:30p.m. This Shakespearean comedy portrays the adventures of four young Athenian lovers and a group of amateur actors who are manipulated by the fairies that inhabit the forest. It's a crowd-pleaser for both adults and children alike. There is a "Cutest Dog Contest" every Saturday night at intermission. The winning dog makes a stage debut as "this dog, my dog" in the final act! Can't make it for here for this performance? 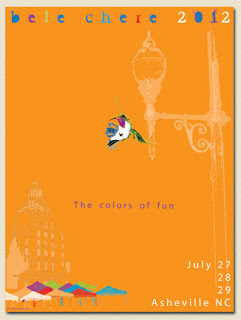 Not to worry, the 2012 season is in full swing and offers a variety of performances throughout the summer. Be sure to check out the 2012 season schedule for details. The performances are free, but if you'd like to support the theatre a $5 donation can be contributed during intermission. Feel free to bring a picnic meal to enjoy before the performance. Or, visit the concession stand which offers candy, snacks, and beverages. There is a food truck at the entrance of the amphitheatre on most nights. Bring a lawn chair or blanket to sit on or lawn chairs may be rented and blankets may be purchased at the concessions stand. Call the box office at 828-254-5146 at least 24 hours in advance to reserve a lawn chair in the best seating area for only $2 per person. You might want to bring bug spray, an umbrella or poncho (in case of a light rain), and a sweater, wrap, or light jacket since summer nights can get chilly in the mountains. Speaking of rain, performances usually continue on through drizzle but may be delayed during rain storms. Performances are only cancelled during extended major downpours and electric storms. Public restrooms are available near the entrance and at the Asheville Masonic Lodge. Pets are welcome, just be considerate of others. We hope you're as excited as we are about Shakespeare in the Park! We hope to see you there. Don't forget if you're visiting us here over July 4th, read about some great Fourth of July activities to add to your itinerary, too. Have you experienced a performing arts production during a visit to Asheville? Tell us about it. We always love hearing from you!